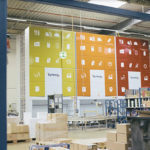 Lyreco has, once again, chosen Modula as its preferred supplier of Vertical Storage for its facility at Barsinghausen in Germany. Westgate Group recently partnered with Kingsland Drinks to provide an additional production zone at Kingsland’s existing Manchester warehouse. James Jones & Sons, the UK timber company, has revealed a new venture it says will dramatically improve the quality, length of life, and environmental benefits of wooden pallets, and significantly reduce their whole life cost. ORBIS has a wide range of pallets manufactured solely for the European market. Have you seen Automated Guided Vehicles and thought “If only…”? Do you love what they do but always thought “I can’t justify the investment”? In these times of increasing automation, it’s worth noting that there are still many companies that prefer the flexibility of using a manual retrieval system for picking products to be shipped. Union Industries, the Leeds-based, employee-owned manufacturer, is on track for its most successful year since it was established in 1975, with its half-year report revealing it is set to turnover in excess of £7m in the 16/17 financial year. Union Industries has returned to its long-standing client, Tate & Lyle Sugars, to install a further four high speed doors and carry out a full refurbishment of another two, at its Silvertown-based facility, which already boasts 26 Union doors. Way Ahead Support Services, part of Mid-Warwickshire Mencap, an award winning local charity founded in 1966, supports people with learning disabilities to remain independent.